For much of the year, Oakland doesn't resemble the “sunny California” so often shown in movies or on TV. While Oaklanders do get quite a few days of sun, gentle warmth is much more common than the beach-worthy heat associated with Southern California. On the bright side, residents and visitors don't have to worry about frequent sub-freezing temperatures, snow, or other weather problems that plague much of the country. Oakland's temperatures typically stay within a comfortable narrow range: The average low in January and February, which tend to be the coldest months in Oakland, gets down to just under 45 degrees Fahrenheit (7 degrees Celsius). The average high in September, typically the hottest month, is around 75 degrees Fahrenheit (24 degrees Celsius). This means that if you are not a fan of extreme temperatures—either high or low—Oakland could offer the perfect climate. You do not need completely separate wardrobes for various seasons. Wear a light shirt or tank top with jeans in summer, and add a sweater or raincoat in winter, and you're all set. Locals have the luxury of being able to complain about the weather being “freezing” when it's 45 or 50 degrees Fahrenheit (7 to 10 degrees Celsius) and “burning hot” at 75 or 80 degrees Fahrenheit (24 to 27 degrees Celsius). Although the season starts off rainy with between 3 and 4 inches average each March, it dries up by May and June, which both get less than an inch each. Meanwhile, high and low-temperature averages rise steadily throughout the season, starting off with highs of 64 degrees Fahrenheit (18 degrees Celsius) in February and climbing to 71 F (22 C) by June. What to pack: The old Bay Area adage of "always bring a sweater" is especially true early in the season when winter lows keep spring nights chilly. You should plan outfits you can layer and pack a variety of short and long-sleeved shirts, sweaters, pants, and even a light jacket. As the rain all but disappears and the temperatures continue to climb, some parts of Oakland can get downright sweltering in the summer. Additionally, less than an inch total falls throughout the entire summer with July getting absolutely no rainfall most years, while September gets the most at 0.2 inch. What to pack: While the nights are still chilly and might require a light sweater or jacket, the warm summer temperatures mean you can break out the shorts, tank tops, and sandals during the day. However, be sure to bring a pullover or light jacket if you plan to stay out after dark as you'll likely still need something warm, especially toward the beginning of the month. 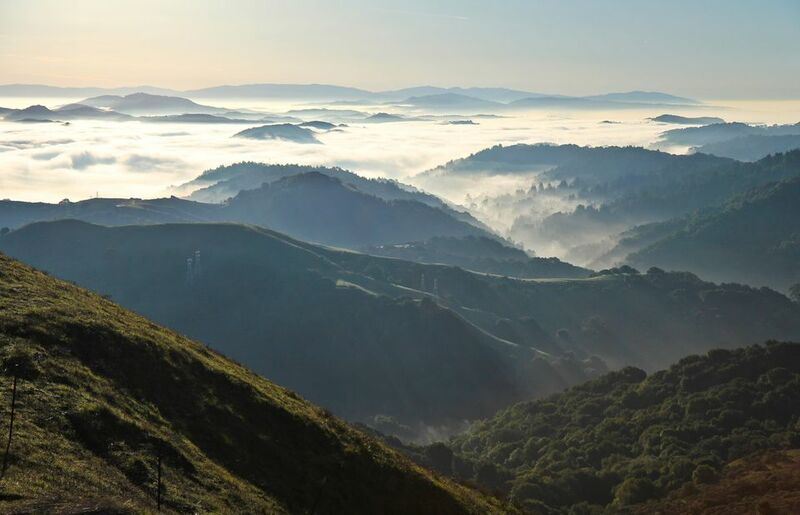 Additionally, summer is a great time for outdoor adventures in Oakland, so be sure to pack hiking boots and gear if that's something you're interested in adding to your itinerary. The heat from summer subsides each year around mid-October, replaced instead by heavier rains, thicker fogs, and cooler night temperatures. While September only gets around two-tenths of an inch of rain, October and November get 1.4 and 2.9 inches, respectively, and December is even wetter at 4.5 inches. Depending on what time of the season you visit, you may also be treated to what's known as "second summer," a period of unseasonably warm weather that comes to the Bay Area sometime between October and January each year. What to pack: If you're visiting Oakland in September or October, you should still be able to enjoy your trip comfortably in little more than a light sweater or coat at night and a T-shirt and pants during the daytime. However, later in the fall when the leaves start changing colors, you may need to bring a jacket with you well into the morning and early in the evenings as the fog and cold begin to creep in earlier throughout the season. Despite being the coldest and wettest season of the year, winter in Oakland is still relatively mild, and temperatures usually don't get close to freezing. However, with an average number of 10 to 11 rainy days per month for much of the season and overall accumulation of around 17 inches (over half the annual rainfall), you should prepare for some unpleasant days no matter what month you visit in the winter. What to pack: Due to the volatile nature of Oakland weather during the rainy winter season, you'll want to pack a variety of clothing to accommodate all temperatures and conditions. Remember to bring a raincoat and umbrella in addition to layered clothing to stay warm and dry all season long. As you might guess from Oakland's proximity to San Francisco's notorious layer of fog, the weather is often overcast and foggy even when it isn't actually raining. The hills to the east of Oakland and Berkeley trap the fog here rather than letting it blow further inland. This becomes dramatically clear if you drive from Oakland into the suburbs on the other side of the hills on a foggy day. In doing so, you will go through the Caldecott Tunnel. There's a good chance that as soon as you exit the tunnel, you will find yourself emerging into the warm sunshine. On many days that start with high fog or just being overcast, the sun comes out before noon. If you want to do something that benefits from a clear view—such as climbing a mountain, hiking in the hills, or going up the Berkeley Campanile—plan to do it no earlier than 11 a.m. or noon. This will give the fog a chance to burn off. Oakland gets about 23 inches of rain annually, spread out across approximately 60 days. Snow is almost unheard-of—though it can occasionally be seen for a day or two on nearby Mount Diablo. Even this is unusual enough to typically make the local news when it happens. Expect brief bouts of hail once or twice a year, with individual pieces rarely measuring more than 0.25 inch across. Rain often comes in stretches that last several days, interspersed with days that are cloudy, foggy, clear, or even sunny. It's normal to get days of sunshine and gentle warmth even in winter. Thanks to the consistently mild temperatures throughout the year, the rain is more of an uncomfortable nuisance than a serious problem. The downside to our consistently gentle climate is that many local drivers seem to have no idea what to do in the heavy rain, so be very careful if you're driving during a storm.